Happy New Year of the Dragon! 龙年快乐! In a heavy saucepan, heat the oil over medium heat, make sure there's at least 3 inches of oil in the saucepan. Spread the sesame seeds over a shallow plate and place a bowl of water next to it. Dissolve the sugar in a cup of boiling water. Place the rice flour in a large mixing bowl, make a well in the middle of the flour and pour the sugar water mixture into the well. Stir and knead the flour until it forms sticky dough, adding a little more water if necessary. Take about 1 tablespoon of the dough (about the size of a golfball), push your thumb into the middle of the dough to make indentation. Add about 1 teaspoon of bean paste to the hole, shape the dough over the top to seal, make sure that the bean paste is completely covered. Repeat with the remaining dough. 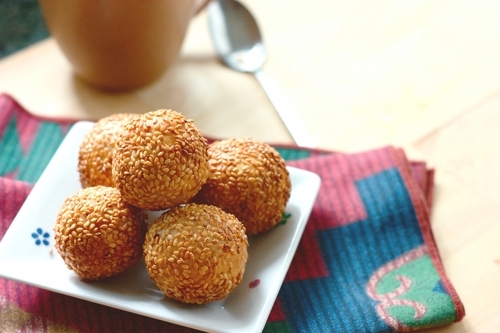 Dip a ball into the bowl of water, roll the ball over the sesame seeds. Repeat the process with the remainder of the ball. Deep fry the sesame balls, a few at a time, in the hot oil. Once the sesame seeds turn light brown, use the back of the spatula to gently press the balls against the side of the saucepan. 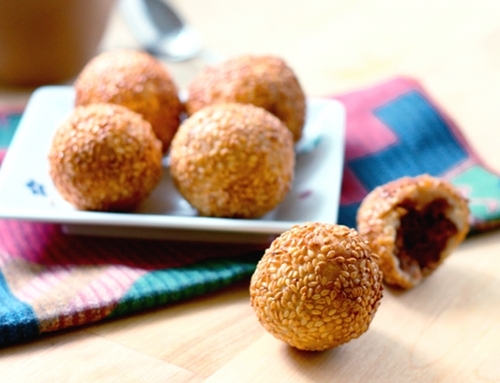 Continue applying pressure as the balls turn golden brown and expand to approximately 3 times their normal size. Drain the balls on the paper towel. Serve warm. These look amazing! So professional. I have never tried anything like this before but they look so tasty and fabulous. Great post! Thanks, Dara. This is my first try also. These look amazing and I love the aduki paste. Very nice. Happy New Year! Thanks, Suzi. They tasted great. In fact, one batch only lasted about 20 minutes in my household LOL. These are my favorite snack! When you press them against the side of the pan, are you trying to flatten them, or are you just making sure they are completely submerged? Thanks! I was not trying to flatten them. 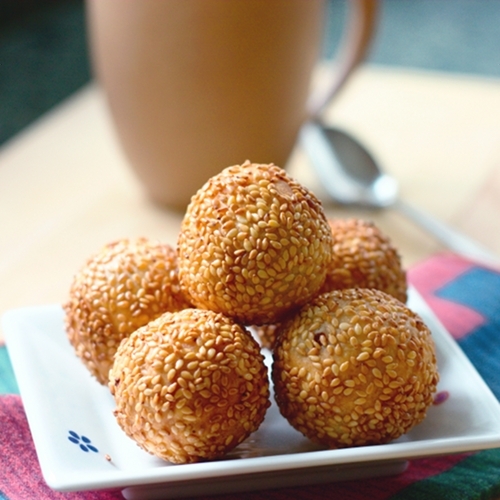 I think I like my sesame balls to be fairly round, LOL. But somehow by pressing the balls, they expand quite a bit. These are one of my favorite treats ever, but until now my husband has had to buy them for me 400 miles away (he's a truck driver) when he's on his weekly run to Newark, CA. Now I can make my own. I'm looking forward to trying out your recipe. Thanks so much for sharing!! !